The challenge? 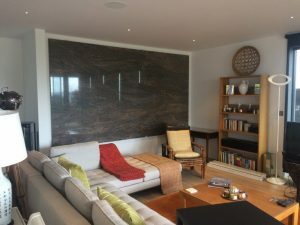 How do you hang a 3.4 x 1.9m, 650+kg slab of granite onto the wall of someone’s living room, where access to the property consists of an almost vertical road for a driveway and about 10 metres of uneven, winding steps between the van and the granite’s final destination? The answer? Kernow Stone, of course. We recently completed one of our most logistically challenging but ultimately satisfying projects at a property in St Mawes. The client had spotted this slab of Paradiso in our yard and had fell in love with it. Nothing unusual thus far. But instead of wanting it as a kitchen worktop or a fireplace hearth, they wanted it hung on their wall. Upon an initial site visit, we saw that access was a complete nightmare. The property is on the hills overlooking St Mawes Harbour and the driveway into the property is an extremely steep, narrow, winding hill. Not only this but from the driveway, access to the property is down a set of broken, winding steps that would not be suitable at the best of times, let alone when transporting a massive slab of granite. Through liasing with the builders and the client, it was arranged for scaffolding to be built from the driveway to the front door of the property to enable smooth access whilst the wall and floor where the granite was going was to be reinforced to ensure it was fit for purpose. The fitting day came we had meticulously planned everything to ensure a smooth fit. We took all the necessary procedures to ensure that everyone would be safe, that nothing would be damaged and most importantly, that we had our Paradiso slab looking like.. well.. paradise! You can see the finished article below…. ‘Just to say an enormous thank you to Tom for getting the installation organised and for you and your guys for bringing the stone here on Thursday and installing it. I know Dave had a team here as well to help and I know everyone was needed so thank you very much. The stone is awesome. We absolutely love it and it looks amazing in situ. Tom suggested polishing the edges and I am so glad that he made that suggestion as it really makes the piece feel like a finished piece.